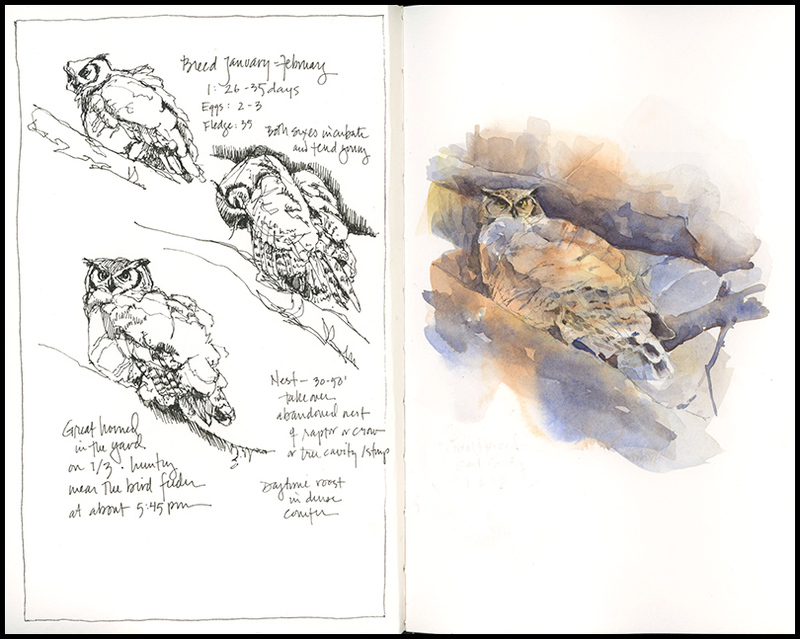 This entry was posted in Birds, Journal, Watercolor and tagged barred owl, birds, great horned owl, nature, nature sketching, winter by Jean Mackay / Drawn In. Bookmark the permalink. I saw a Great Horned Owl just 2 days ago – got a fantastic photo too – I did not know they mate in Jan and Feb! I’m hoping he makes my yard his home territory 🙂 Thanks, Jean!! Wouldn’t that be great for you! I hope you see– or at least hear them often. Ravens have such personality– and such loud vocalizations. Enjoy them. such great sketches and drawings!! How did you get that gorgeous violet color? Hi Melissa- It’s all ultramarine and burnt sienna (just a touch of yellow ochre). Testing out QoR watercolors from Golden, so perhaps that’s part of it. I love the range of shades you get with those two! Wow, that’s hard to believe. Have you ever compared burnt sienna with transparent red oxide? That’s what I’ve been using, & I’m wondering if I should switch…. Yes- I recently tried red oxide and got a nice range of purples with ultramarine. I think burnt sienna tends to go more brown and smokey gray and all the way to black. If you buy burnt sienna, I recommend getting Windsor and Newton over DS or M.Graham. Those brands tend to be less transparent and chalky. Good to know…Thanks for taking time to comment! Yes, thanks for the tips and techniques – I always find them interesting and helpful. Good to know! I’ll keep it up. I absolutely love owls, although I have only seen them once in nature naturally. How beautiful. I’m always amazed that people find them at all. They are such masters of hiding. I have only seen them a few times in the wild– sometimes in flight, sometimes perched. I think you’ll like it Rebecca. 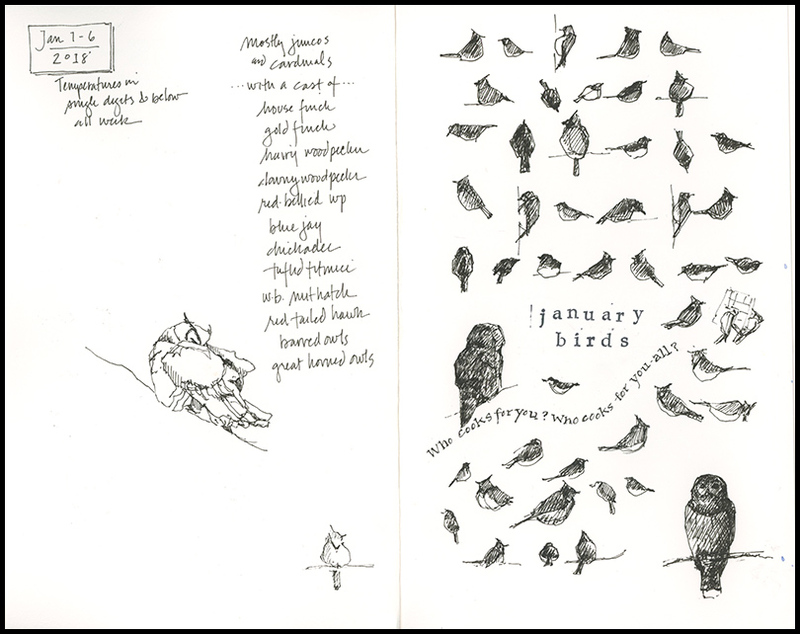 The life of the bird will come into your sketch more and you won’t have to worry as much about using copyrighted images. There are lots of nest cams now so you’ll find a variety of subjects. I like your suggestions, keeping the pen moving, watching the subject, and using video to keep the bird’s personality – brilliant, makes good sense. Our cast of characters is not very different, oddly, even though we’re on the other side of the country: juncos galore (a different species but very similar), chickadees (two kinds, a treat! ), nuthatches, the hairy and downy, along with the occasional privilege of seeing the pileated, The song sparrow comes to, and the towhee – both are a little different than eastern versions but you’d know them in a split second. Our jay is not as flashy, nor as brash, at least not here, though Stellar’s jays have the same reputation as Blue jays. I hope we hear an owl….that would be great. Keep warm! Let me know if working from video works for you. So glad you found me…I so enjoyed seeing the artwork on your blog.